Among the major challenges of studying Alzheimer’s disease and other dementia-related brain disorders: modeling and replicating the biological structures that play a huge role in those conditions. 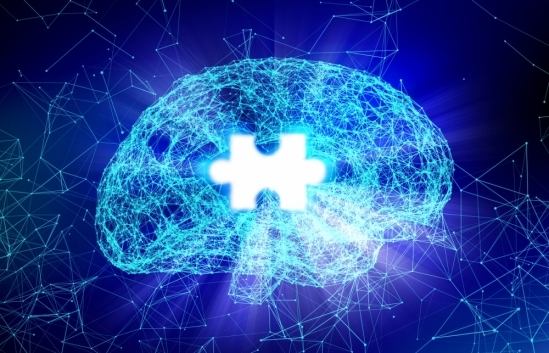 The pathological version of the tau protein, which is responsible for the neurofibrillary tangles present in the brains of those with any of several types of neurodegenerative diseases, can be accessed only postmortem from humans and from animal models. As a result, they provide limited and precious opportunities for scientists trying to solve the mystery of how malignant tau fibrils develop, propagate and lead to disease. Meanwhile, experimentalists have struggled to recreate conditions under which “normal” tau — a protein that serves to stabilize the architecture of our neurons — goes “bad,” in hopes that observing each step in tauopathic progression of protein tangle formation would lead to future insights into how to mitigate neurodegeneration. “If you ever want to do structure-based characterization, which is necessary to differentiate between the pathways that lead to different diseases or no disease, you need to recreate the pathological aggregate structures, and that can only be done in the laboratory,” said Songi Han, a professor of chemistry and biochemistry and of chemical engineering at UC Santa Barbara. In-depth structural study of tau-related brain diseases is an iterative process that depends on reliably replicating the disease process, one that involves not just the development of pathological tau fibrils, but also their propagating behavior, she explained. Now, Han and her research group have found that what has been thought of as merely a “helper” in the in vitro aggregation of tau may instead point to a more significant and active mechanism in mediating the pathological aggregation process. Their paper “Cofactors are essential constituents of stable and seeding-active tau fibrils,” is published in the Proceedings of the National Academy of Sciences. The general trend with tau aggregation experiments, said co-author Yanxian Lin, has been to induce aggregation using “naïve” tau (that is, tau protein that has not developed the fibrils) and a cofactor. “The most popular one is heparin,” Lin said. “This had been a model to study the aggregation of tau in laboratories for more than two decades, because the resulting heparin-tau fibrils resemble the ones found in the brain according to low-resolution imaging techniques.” However, recent studies, including some performed by the Han Group, have shown that the fibrils at high resolution are entirely structurally different from the type found in Alzheimer’s disease, and thus perhaps not a representative model of pathological fibril. Likewise, attempts to propagate tau fibril using malignant seed templates derived from brain tissues have had limited success, thus consuming precious specimen. Han and colleagues discovered that the addition of a cofactor to the recipe containing naïve tau and seed changes everything. “They all interact with one another,” Fichou said. The researchers’ study indicates that the naïve tau takes up the shape of the pathological tau seed that serves as a fibril template, but only in the presence of a cofactor. Without a cofactor it becomes “too energetically expensive” for the naïve protein to copy the malignant one. It also raises the possibility that without the cofactor, the aggregates — often deemed “untouchable” once formed — may not be as robust. Importantly, they say, a cofactor makes it possible to replicate the seeded aggregation process many more times — which gives researchers the much-needed opportunity to investigate disease-related tau aggregation. The Han lab researchers are careful to point out that this newly discovered mechanism does not address the complexity of the brain and the biological studies necessary to find a cure for tau-related brain diseases. However, they say, it is a stride in the direction of being able to replicate an important part of tau pathology — propagation — in the test tube, and may hint at a future line of research into devastating conditions such as Alzheimer’s disease, frontotemporal dementia, chronic traumatic encephalopathy and others. “What is really necessary in the future is to discover the physiological cofactors that drive tau aggregation,” Han said. Research on this study was conducted also by Jennifer N. Rauch, Michael Vigers, Zhikai Zeng, Timothy J. Keller and Kenneth S. Kosik of UC Santa Barbara; and Jack H. Freed and Madhur Srivastava of Cornell University.